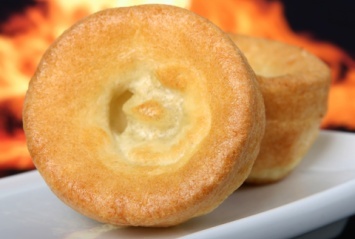 This yorkshire pudding recipe is the perfect traditional accompaniment to roast beef. There is nothing quite like watching the pudding rise in the oven, and thinking about how amazing it will taste oozing with tasty beef gravy. Note the tips section below the recipe. The ingredients must be at room temperature when mixed or they will not puff. Sift the four and salt into a bowl. Make a well in the center. Pour the milk into the well. Stir in the milk with a whisk. Beat the eggs until fluffy then beat them into the batter. Add the water. Beat the batter well until large bubbles rise to the surface. You may let the batter stand covered and refrigerated for up to 1 hour. When ready to bake, then beat it thoroughly again. Heat a 9"x12" oven proof dish or muffin tins with about 1/4 inch hot beef drippings or melted butter added to them. Pour the batter into the hot tins. Bake the pudding for 20 minutes. Reduce the heat to 350°F and bake 10-15 minutes longer. Serve it at once. Yorkshire pudding should rise and be light and airy on the inside. The absolutely crucial element is the hot oven and hot muffin tins. If they are not hot and the liquid in them isn’t really hot, the yorkshire pudding won’t rise as it should. There are two keys to a perfect Yorkshire pudding: The ingredients must be at room temperature and the muffin tins must be hot before adding the batter. While the roast is resting the puddings can be rising. Get ready for an easy and delicious taste sensation. Roast beef and our yorkshire pudding recipe are a perfect combination. Find our prime rib recipe here. If you like this recipe, I’d love you to Pin it to Pinterest, Tweet about it, Like it on Facebook and leave a comment at the far bottom of the page. Also, for more tips, read the comments below from other Cookingnook.com followers. 7/8 of a cup of flour? Really? Wouldn’t a whole cup of flour work? Yorkshire pudding is a bit tricky and the batter really should be a particular thickness. That extra bit of flour may make the batter too thick. If you’re using muffin tins how much batter should there be in each tin? Fill the tins about 1/2 of the way. They will expand as they bake. Yorkshire Pudding my Mum made. I’m not sure if this recipe would turn out that well. Mixing the milk with the flour will almost make it like a cement. My Mother made Yorkshire pudding often. My Grandmother was British and taught my Mum how to make it. Mix the flour and salt in a bowl and set aside. Slowly add milk while beating eggs. Add flour mixture in 3 or 4 parts, beating well after each addition. Heat a 9″x12″ oven proof dish or muffin tins with about 1/4 inch hot beef drippings. Pop in oven until it starts to smoke slightly. Pour the batter into the hot tins. Bake the pudding for 20 minutes. Reduce the heat to 350°F and bake 10-15 minutes longer. Serve it at once. If using muffin tins cooking time is approx. 15 – 20 minutes adjusting oven temp as necessary. Today is the very first time that I have tried to make Yorkshire Pudding. I initially used another recipe that didn’t have all of the tips provided here, and my little puddings did not rise. I tried again with this recipe, and voila! Huge, perfect, fluffy Yorkshire puddings. Sooooo yummy in au jus! I think I ate more Yorkshire pudding than Roast Beef! I carefully followed all of the directions, except for the overly precise measurement of the flour. I just went with 1 cup, and it turned out just fine. Thanks so much for this recipe. I’m going to use it again and again. Yorkshire pudding turned out great! Made this from scratch, followed the tips to have the milk and eggs at room temp (took out while preparing the roast to go in), and it turned out great. Family was surprised at how good they were. Only problem – only makes 6 (which fit perfectly spread amongst he muffin tins) – if more than 2 are eating them, recommend making a double batch. I used this recipe when we made a Bison roast. The meat was quire lean and we had almost no drippings so I used grapeseed oil in the pan. Other than this variation I followed the recipe exactly and was told by many people at the large dinner party it was the best they had ever had. This was the first time I had ever made Yorkshire pudding, so this recipe is a winner! This is very close to the Betty Crocker recipe, but it calls for 1 cup of milk I started using half milk and half water a while ago in it and it is much better that way. Try experimenting with different seasonings, I am adding fresh ground pepper, sometimes rosemary, or chive or parsley. I also use bacon drippings to cook them in and do not use anywhere near the 1/4 inch just less then a teaspoon per muffin cup seems to work and even then there is always extra left in the pans after the puddings cook. ive never made this before, i was scared it wouldnt turn out, but these little gems are awesome! @ thanks for ur tips too, i owe ya~! I’ve never made yorkshire pudding before and it was reqested by a dinner guest, so I looked up this recipe online and followed it to a tee. My dinner guest said he’s had a lot of yorkshire pudding in his time but mine was by far the best ever.. it was perfect and puffed up beautifully. I used butter in the muffin tin and all I heard throughout dinner was mmmmmmmmmm. Thanks so much, this will be a favourite in my home from now on. I have to admit that after witnessing generations of women in my family make perfect yorkshires I had yet to aquire the skill myself! I was skepticle, to say the least, When the batter was only a little thicker then water but they turned out fantastic! I will never deveate from this recipe. They were perfect! The recipe is sound. I have made many Yorkshire puddings using a similar recipe. One thing that may be a consideration for those not wanting beef (fat) dripping, try using vegetable oil or as I do, use olive oil instead of beef dripping, cuts back on the cholesterol and it comes out much the same.